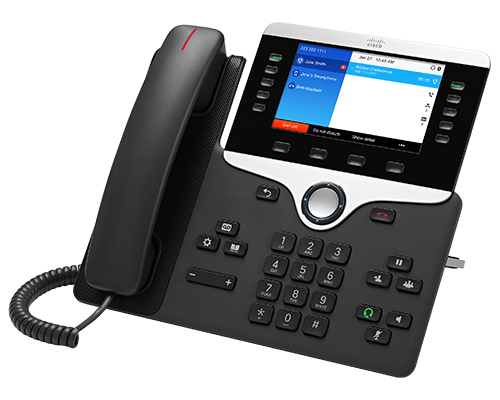 With the Cisco IP Phone 8851, you can increase personal productivity through an engaging user experience that is both powerful and easy-to-use. The IP Phone 8851 combines an attractive new ergonomic design with wideband audio for crystal clear voice communications, “always-on” reliability, encrypted voice communications to enhance security. In addition, Cisco Intelligent Proximity brings the worlds of desk and mobile together for you when you are using your mobile device at the desk for your work. You can move the audio path over to the Cisco IP Phone 8851 during active mobile calls to take advantage of its superior audio acoustics. An example would be to share a conversation with a colleague who you want to listen in. This capability gives you greater flexibility and superior user experience when at your desk. Supports a built-in Gigabit Ethernet switch for your PC connection. Find Small Business Phone Plans for Your Unique Needs.